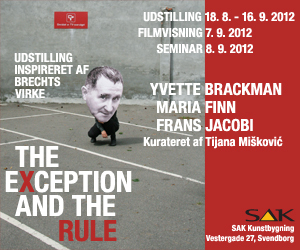 In the exhibition ‘The Exception and The Rule’ at the SAK Art Center in Svendborg the three artists Yvette Brackman, Maria Finn and Frans Jacobi have let themselves be inspired by the world famous dramatists stay in the small thatched house by Svendborg Sound. In 1933-39 the German dramatist lived in Svendborg – on the run from the Nazi regime in his home country Germany. In Denmark he wrote two of his most important plays ‘Mother Courage and Her Children’ (Mutter Courage und ihre Kinder) and ‘Life of Galileo’ (Leben des Galilei). Today Brecht’s house works as a home for changing artists and writers. Yvette Brackman, Maria Finn and Frans Jacobi exhibit pieces, which in different ways demonstrate the inheritance and inspiration from Brecht – his way of telling stories, his radical ideas about the artwork’s relation to the audience and the arts way of conveying political content. The video installation ‘Round Heads and Pointed Heads’ (2007) is Frans Jacobi’s (DK) new interpretation of Brecht’s play with the same title (Die Rundköpfe und die Spitzköpfe) from 1935 about the ficticious country Yahoo, where a dictator takes power and divides the people in two races. It is a direct comment to Hitler and the Nazi takeover in Germany in 1933, which forced Brecht into exile in Svendborg. Jacobi also shows his newest piece ‘I SAY NO! I say yes!’ (JEG SIGER NEJ! Jeg siger ja!) from 2012. Taking departure in Brecht’s ideas about the political theatre Jacobi has built a new narrative, which takes place in present day Svendborg. Part of the piece is a performance at the opening. The performance and installation have music by Jomi Massage.